Guest post by Taylor Corrado, Nonprofit Marketing Expert at HubSpot whose all-in-one marketing software helps nonprofits attract qualified prospects and convert them into supporters and donors. Your organization has hundreds, if not thousands of donors annually, but do you know who they are exactly? Do you know where to find them? Do you know how they interact with your organization and what inspires them to give? Are they college students, young entrepreneurs, working moms, or retired professionals? Chances are they are a fair mix of all these individuals. Kim Goodwin describes personas in Designing for the Digital Age as “archetypes that describe various goals and observed behavior patterns about your potential [fundraisers] and [donors].” Personas can help your organization identify your different audiences and drive your content creation, campaigns, volunteer opportunities, and constituent relations and retention. 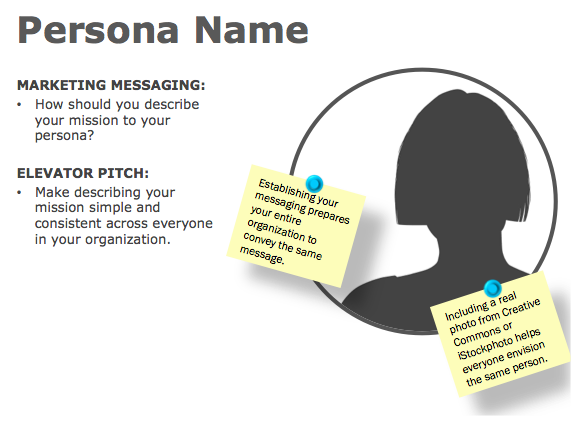 Okay, so donor personas are a really important part of your organization. But how do you actually define one? The good news is they aren’t difficult to create. You just need to ask the right questions of the right people, and present the information in a helpful way so your team can get to know your persona(s) better than the backs of their hands. Your existing donor base is the perfect place to start with your interviews, because they’ve already supported your mission and engaged with your organization. At least some of them are likely to exemplify your target persona(s). Reach out to a variety of donors. Your one-time donors, recurring donors, and large gift donors all support your mission for different reasons. Defining how each gives, and for what reasons, will be important for developing your personas, and ultimately, for attracting more of the same in the future. Be sure to be clear when you reach out to these individuals that you are looking for feedback, not soliciting donations, and will keep their personal information completely private. Even though these individuals aren’t exactly donors, they do support your organization with their time and are twice as likely to make a donation in the future. Reach out to your past and present volunteers and find out more about them as a group. Their reasons for supporting your organization will be different than past donors’ reasons and you’ll gain insight into what inspires them to volunteer and possibly donate in the future. Friends, family, and even co-workers of your existing donor base are more likely to donate to your organization if motivated by someone from within their personal network. Extending the invitation to interview these people will provide insight into how you can reach a larger, new donor base that has an extended tie to your organization through a relative, friend or co-worker. These individuals may or may not have knowledge of your organization, but they are more likely to support you than a total stranger. You’ll be able to gage their knowledge of your organization, if any, and find out if they support any other organizations and why. Create a list of the individuals you are reaching out to, including their phone number and email address. Send out separate invitations to each group you’ll be interviewing. You can conduct these interviews in person or use online conferencing software, like Skype or Gotomeeting.com to conduct them online. If you do not have an individual’s email address, have a few volunteers make calls to potential interviewees. While you may not need them in all scenarios (e.g. donors who want to talk to you), incentives give people a reason to participate in an interview if they don’t have a relationship with you already. A simple gift card (like an Amazon or Visa credit) is an easy option. Incentives will be useful for your third-party audience who may be somewhat disconnected with your organization, but are still willing to help. If gift cards are not within your budget, you can wave or discount the registration fee to your next fundraising event for those that participate in the interviews. 2) Be clear this isn’t a donation appeal, especially with non-donors. Communicate in your invitation that you’re doing research and that you want to learn from them. You are not getting them to commit to making a donation; you’re getting them to commit to telling you about their lives, jobs, and inspirations. 3) Make it easy to say yes. Take care of everything for your potential interviewees — suggest times but be flexible; allow them to pick a time right off the bat; send a calendar invite with a reminder to block off the time. Keep the interview between 20-30 minutes so you don’t take too much of their time. Offer in-person interviews as well the option to do it over the phone or via Skype, whichever is most convenient for the interviewee. Unfortunately the answer is – it depends. Start with at least 3-5 interviews. 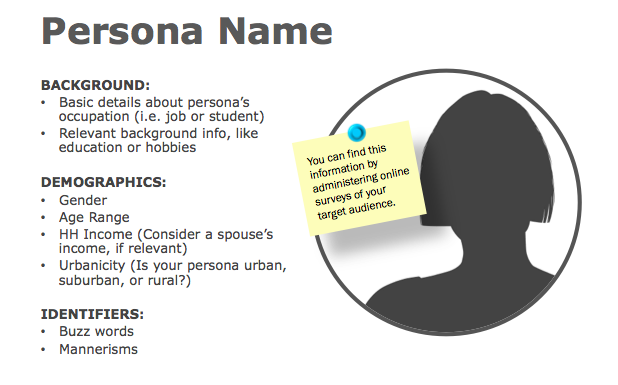 If you already know a lot about your personas, then that may be enough. You may need to do 3-5 interviews in each category of interviewees (donors, volunteers, third party networks). The rule of thumb is: when you start predicting what your interviewee is going to say, it’s time to stop. Through these interviews, you’ll naturally start to notice patterns. Once you start expecting and predicting what your interviewee is going to say, that means you’ve interviewed enough people to find and internalize these patterns. The #1 tip for running successful persona interviews is following up every question with “Why?” You’re trying to understand your donors’ or potential donors’ goals, behaviors, and what drives them to give. People are not always great at reflecting on their own behaviors. I’ll frequently start with a simple question — one of my favorites is “What inspires you to support a cause or organization?” — and then spend a good amount of time diving deeper into that one question to learn more about that person. You learn more by asking “Why?” than by asking more simple questions. Once you’ve gone through this process, you’ll have a lot of meaty, raw data about your potential and current donors. But what do you do with it? How do you distill all of that so it’s easy for everyone to understand all of the information you’ve gathered? The next step is to identify patterns among the different interviewees, develop at least one primary persona, and share that persona with the rest of the organization. 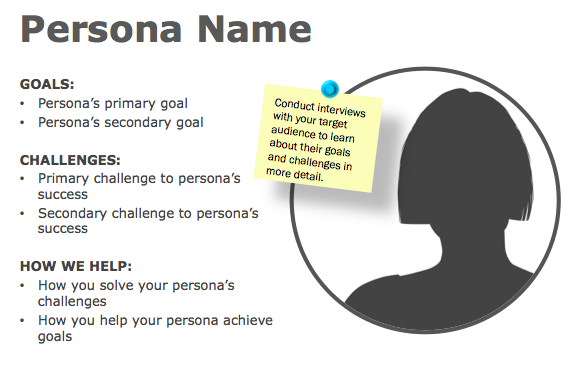 Input all of the information you’ve distilled into this persona template so everyone can benefit from the research you’ve done, and have an in-depth understanding of the person they’re targeting every day. If you didn’t feel comfortable asking questions on the phone, you can send an online survey prior to your interview to collect this information. It’s also helpful to fill in some buzzwords and mannerisms of your persona that you picked up on during your conversations to make it easier for people on your development team to identify personas when they’re talking to prospective donors. This is where you’ll distill the information you learned from asking “Why” so much during those interviews. What keeps your persona up at night? Most importantly, tie that all together by telling people how your organization can educate and inspire them to give. Include some real quotes from your interviews that exemplify what your personas are concerned about, who they are, and why they give. Then point out the objections they might raise so your fundraising team is prepared to address those during their conversations. Tell people how to talk about your mission with your persona. This includes the nitty gritty vernacular you should use, as well as a more general elevator pitch that positions your mission in a way that resonates with your persona. This will help you ensure everyone in your organization is speaking the same language when they’re having conversations with prospective donors via email, phone, on your website or in person. Finally, make sure you name your persona, and include a real life image of your persona so everyone can truly envision what he or she looks like. Just visit a site like Creative Commons or iStockphoto and search for someone that exemplifies what your persona might look like, and think of a name that makes sense — like Donor Daisy, or something similarly catchy. It seems silly, but it really helps put a name to a face, so to speak! 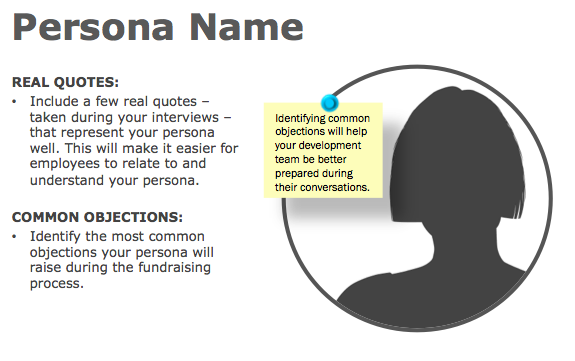 Have tips or questions on researching and compiling donor personas? Share them in the comments!